Our galaxy could have 100 billion brown dwarfs or more, according to work by an international team of astronomers, led by Koraljka Muzic from the University of Lisbon and Aleks Scholz from the University of St Andrews. The false-color near-infrared image of the core of the young massive cluster RCW 38 shown above was taken with the adaptive-optics camera NACO at the ESO’s Very Large Telescope. RCW 38 lies at a distance of about 5500 light years from the Sun. The field of view of the central image is approximately 1 arc minute, or 1.5 light years across. 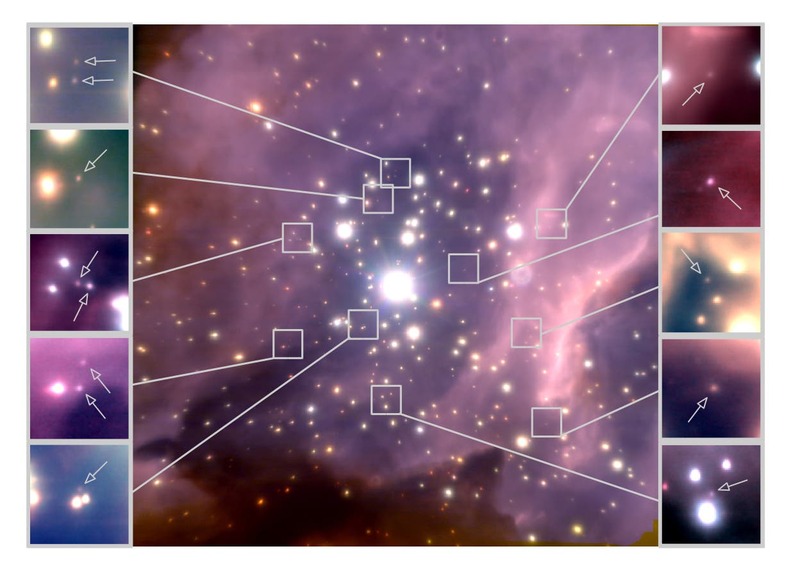 The insets, each spanning about 0.07 light years on a side, show a subset of the faintest and least massive cluster candidate brown dwarfs (indicated by arrows) of RCW 38 discovered in this new image. These candidate brown dwarfs might weigh only a few tens of Jupiter masses, or about 100 times less than the most massive stars seen towards the centre of the image.